If you remember, earlier in the beginning of my blogging journey, we have prepared a detailed tutorial about the Top 10 Pakistani bloggers of the year 2013. Today i have come again with one another interesting tutorial which would prove that India is not left in the field of blogging and online marketing. In today's post i will show you the top 20 most popular bloggers of 2014. All these bloggers will show here infographically. Here we are going to show only those bloggers belonging to India. Indeed India is a special country counted in the list of Top development countries. It has gain more popularity in all fields like education, business and technology. So i was thinking why not show its blogging profession to the whole world. India has now more than 20+ professional bloggers & their talent show the ability to the whole world that we are not behind in any field of technology. So here is a list of 20 bloggers blogs from the year 2014.
Credit: We always respected the copy rights law. So the presented Infographic has been taken from ShouldMeLoud.com if you are interested in sharing this news, then kindly do link back to the SML. All the above are Pro Bloggers belonging from India different big cities and villages. So we have also compiled a list of these top Indian's bloggers in the following rank format in the below section. 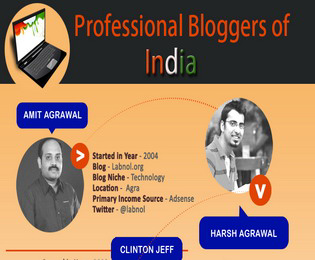 We hope this tutorial may have helped in finding all the most popular & pro bloggers of India 2014. We are greatly thankful to SML to give us this awesome Infographic view. So If we miss any blogger by a chance then kindly do let us know through the below comment section. Thanks Adil bro...for your kindly feedback..Really all the above are energetic bloggers from India. Hope we would have been there in coming years....thanks. I really idolized this two bloggers (Amit and Harsh Agrawal). They are really great bloggers. I wish probloggertricks will be the next in the list in 2014. Thanks for praising..Inshallah we will try our best to be the Top in the list soon in 2014..THanks. Great job you did dear. I think you will also become one of them but you need to do hard work dear. Whoa! Awesome work bro! Compilation of all the famous (and awesome) bloggers of India is not a child's job! PROUD OF INDIA! Great work Bro, you are always number one in sharing the list of Professional Bloggers From India.thanks for sharing this interesting infographic. Thanks buddy...I love indian bloggers their blogging styles and hardwork...Thats why i often write about them....thanks.